It's the contest where the surf has to up -- way up -- in order to happen. 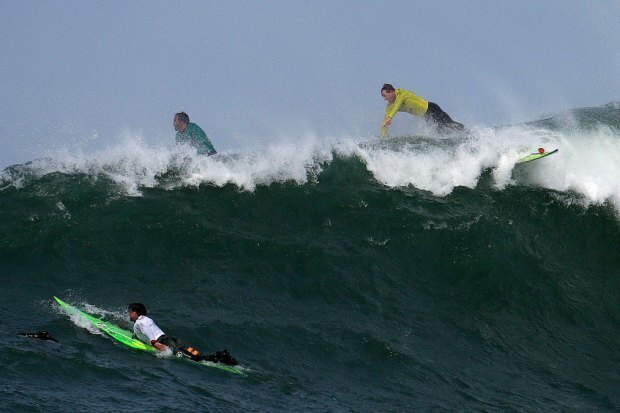 The opening of the Mavericks surf contest near Half Moon Bay has been officially delayed by a month. Organizers for the event announced Wednesday that the earliest the contest could be called is New Year's Day. The contest window closes the end of March. The Mavericks window was supposed to open Thursday, but was delayed by a "lackluster early season for big waves." "By this time of year, we usually have the chance to get out there and surf, get the cobwebs off, so to speak," Mavericks found Jeff Clark said in a statement. "But there hasn't been any decent swell and now we're getting into the holidays. The delayed start also allows for more planning with the public agencies and with on-the-water safety training, according to Clark. The contest is called when the weather and the waves are declared "just right." The hope is to find 40-foot swells. The traditional paddle out opening ceremony is also changing a bit this year. It will be sometime in December when the waves are breaking. Among those invited to compete this year are 2010 Mavericks champ Chris Bertish, of South Africa, 2008 champion Greg Long, of San Clemente, 2005 champion Anthony Tashnick, of Santa Cruz, and 11-time world champion Kelly Slater. There is no guarantee there will actually be a contest. It's all up to the weather. Ideal conditions failed to materialize last year.